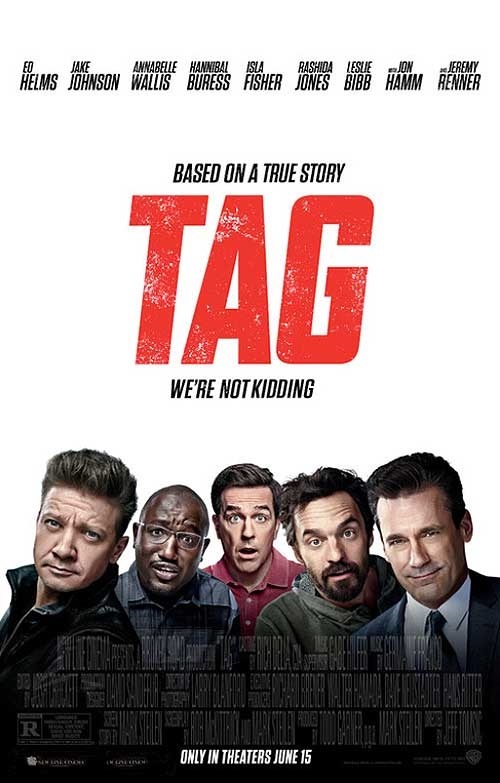 TAG is a film about a bunch of 40-something childhood friends who keep that spark of friendship alive through a ridiculously long-running version of the kid’s classic game. A light-hearted comedy which retains a sweet charm to it, it has a great cast with good chemistry, though it suffers from a slightly inconsistent tone. There’s some knock-out jokes, killer sight gags and top-notch action scenes, the last of which mock the superhero films that Jeremy Renner, who the group is trying to tag, is known for. Renner plays Jerry Pierce – the sole member of the group who is a tag-virgin so to speak, never been tagged – and he’s the target the rest of the gang are gunning for through the film. The stakes are raised by the fact that it’s Jerry’s wedding, but all is not as it seems. The cast make this film, Helms is charmingly sweet but determined, Hamm revels in his character’s arrogance, Joe Jackson is the lovable stoner and Hannibal Buress effortlessly goes deadpan for some of the best lines. Shout-outs too for Isla Fisher’s insanely fun antics and Rashida Jones in a brief but intriguing role as the old flame. The story goes a bit too serious towards the ending which confuses the tone, but this doesn’t get in the way of the laid-back camaraderie of it all – you really get the feeling the actors are relishing every second of it. Stick around for the end credits as it has the real life footage from the story that inspired the film – and though it’s only a few brief flashes, it’s really charmingly adorable, with some brilliant gags. ← Jurassic World: Fallen Kingdom – Does it bite off more than it can chew?